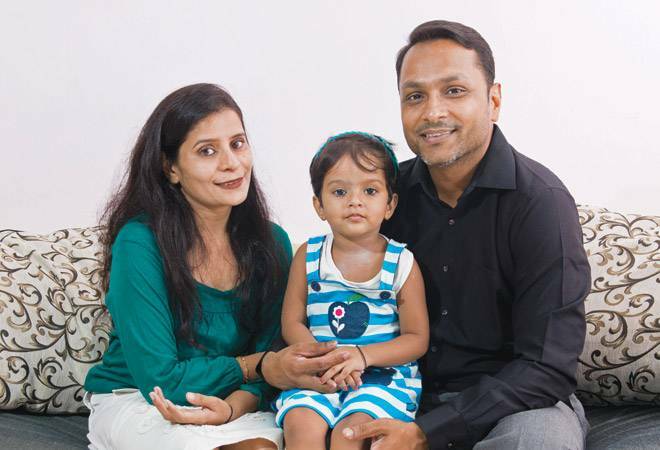 Vijaykumar Kushvaha, 38, works in the financial sector and resides in Vasai, Maharashtra, with wife Meenu (aged 37 and a home-maker) and their three-year-old daughter Myra. The family seems to be doing well, thanks to very few liabilities and systematic investments, but now the couple wants to pursue the life goals that matter. Vijay takes home a monthly net salary of `1.15 lakh out of which `70,491 is spent to meet all expenses while `8,683 is paid towards insurance premiums. He has purchased an endowment plan from LIC and two more life insurance policies, both of which are term plans. As for the medical cover, they have a family floater plan of `10 lakh. The couple has purchased the house where they stay and pay an EMI of `9,984 on a small home loan of `5.82 lakh. As they do not wish to upgrade it, there will be no future expenses under this head. Apart from the home loan, they have not raised any other loan, and that is another plus. The family is expected to generate a total surplus of `6 lakh or so in the current financial year, which should grow as we have assumed an 8 per cent hike in Vijay’s earnings, year on year. In terms of assets, he has invested around `10 lakh in equity mutual funds (MFs) by putting in `25,000 per month and has `2 lakh in equity shares. But unlike many, Vijay has not made any debt investment. The family has a short-term goal – paying back the home loan at the earliest – and a couple of medium-to-long-term goals, namely, Myra’s education until she finishes her post-graduation and her marriage. To meet these goals, Vijay will have to build an education corpus of `70 lakh in today’s value and allocate another `30 lakh for daughter’s marriage. It is assumed that the expenses incurred for a post-graduation degree from a foreign university will be part-funded by the parent and the balance will be met through loans and scholarships. Her graduation expenses may amount to `10 lakh and can be allocated from the overall investment kitty. Therefore, it has not been added to the education corpus. Vijay wants to retire at 60 and will require `6 crore-plus to ensure a comfortable life for himself and his spouse, assuming Meenu will not take up any job. The financial road map presented here is based on the information provided by the couple and plan assumptions are listed at the end. A feasibility study has also been done, taking into account the current assets and investments of the family, along with the year-on-year surplus (yearly income over yearly expenses minus insurance) until Vijay retires. After plugging in the goals as and when they turn up, it has been found that the family will be able to achieve all their goals quite smoothly. However, Vijay must focus on investing future surpluses so that the desired corpus builds up fast, including the crucial retirement fund. The important thing is to channelise all available surpluses into investments in a disciplined and regular manner to fund the goals as and when they come up. The family should review the plan and rebalance their portfolio periodically, preferably every year, to achieve favourable outcomes. 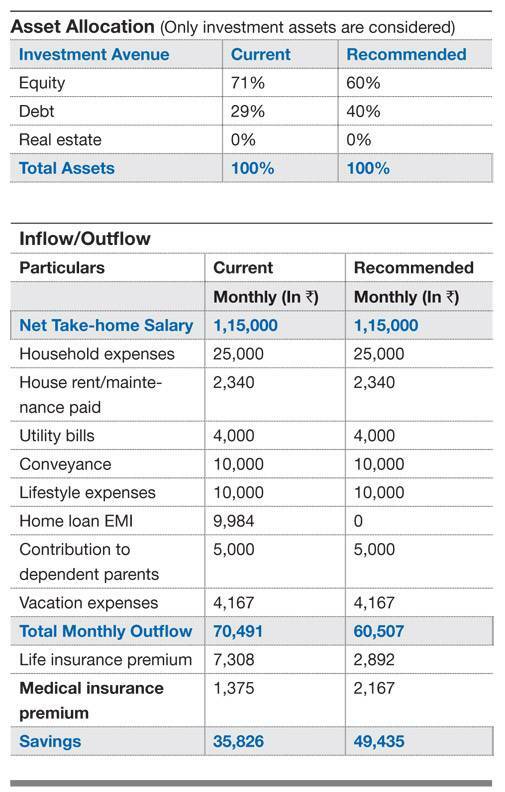 Liquidity/contingency: To meet liquidity needs and provide for contingency, the family should keep `2 lakh in liquid mutual funds and `1 lakh in the savings bank account. It will cover the average monthly cash outflow and help fund an emergency. Vijay should sell his entire equity stock holding and invest `2 lakh in liquid funds. Overall, it will be a good move – there is no need to maintain a separate stock portfolio as equity MFs deal in stocks. Moreover, in equity MFs, a professional fund manager looks after the investments and hence, the outcomes are expected to be good compared to individual investments in stocks. Again, another `50,000 could be raised from existing MF redemption (more on that later) and should be kept in the savings bank account, pushing the cash reserve to `1 lakh. Life and medical cover: Insurance requirement has been analysed based on the expense replacement method where all future expenses, future goals, alternative incomes, existing life insurance cover and current assets and liabilities are taken into account until the younger spouse is 80. As mentioned before, Vijay has purchased term plans worth `1.25 crore and an endowment plan worth `12.5 lakh. The latter should be surrendered at a current value of around `5.5 lakh and the proceeds should be used to pay off the existing home loan. In this way, his annual cost of `70,000 paid for the endowment premiums and the yearly outgo of `1,19,808 on the home loan could be reduced. The sum assured under the current term plans is not adequate. So, Vijay should get another term plan worth `1.5 crore for 25 years. The additional premium for the same will be around `17,000 per annum, bringing the total premium on life insurance down to `34,700. They should buy individual health plans of `5 lakh sum insured for all three family members. A Super Top-up policy of Rs5 lakh with Rs5 lakh deductible for each family member is also suggested. It may be a good idea to buy both from the same insurer for the ease of making a claim. The combined premium will be around Rs26,000 a year for each of them.